Konica Bizhub- Full inline finishing. Our I-Cut router is a compliment to our sign equipment capabilities. This allows us to die cut small quantity items, cut vinyl letters, create custom boxes and cut different types of substrates from Sintra to Gatorboard. Providing this service in house allows us to quickly meet client needs. 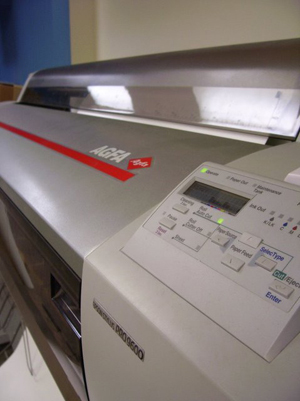 Our D&K automatic film laminator allows us the opportunity to film laminate in sheet form with an automatic feeder. This provides an opportunity for very quick turn around times.